This single-storey Edwardian cottage has a hipped roof and front gable-on-hip extension with a triangular window in the small gable. The porch to the left has several Tuscan columns and a solid balustrade. The water table is continuous with the porch rail. There are two pairs of one-over-one, double-hung, sash windows with horns on the front, a central entrance door, and side-facing steps. On the left side is a small enclosed entry porch, and on the rear, a hip-roofed extension. There are three corbelled brick chimneys. The house is clad in bevelled siding and the foundation is concrete. 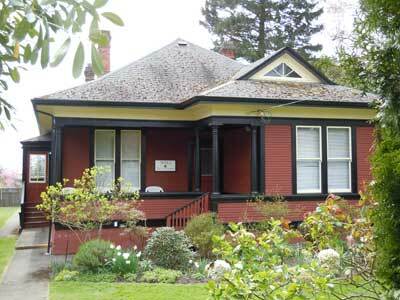 The BC Government built this house for the head gardeners of Government House, 1401 Rockland Av. 1910-12: John Harper Randall (1871-1961) and Irene Mabel (née Dandridge) came to Victoria from England in 1910. John, a landscape gardener, retired in 1939. 1913-15: Percy E. Lamb.1917-18: John Shiner (b. Somerset, ENG 1884- 1924) and Sybilla Henrietta (née Boothby, 1886-1957) came to Canada in 1913-14. John then moved to Tod Inlet as head gardener for Jennie Butchart (1737 Rockland Av, 906 St Charles St, Rockland) until his death. 1920-21: Ernest and Elizabeth Barlow. 1921-50: William Gray Darling (b. Scotland 1886-1975) and Jessie (née Bailey, b. Lancashire, ENG 1880-1960) came to Canada in 1910 and Victoria in 1917. William was head gardener at Government House for about 30 years.